We set off on Thursday the 15th of July 1999 (so as to miss Bastille Day on the 14th) and got back to Bristol on Wednesday the 28th July. 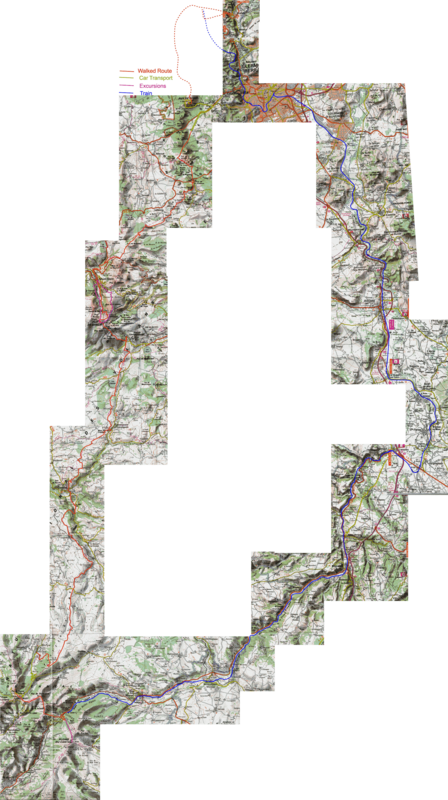 Here is a link to a very large map (943kb) of our route, taken from the 1:100,000 IGN maps 49 and 50. There has been a lot of scanning and fitting together and some of the joins are bad, but it will give some idea of our trip. We got back alright, and, as you might expect, things didn't turn out as we expected. Some things we couldn't do and other things were added. The easiest summary is to look at the sketch map of what we actually did. As you can see we had some vehicular assistance and we stopped walking at Super Lioran. But as far as we are concerned we did very well. To find the story of our journey, click on The Daily Grind on the right or, at the bottom of this page, click on Day 1 and then keep heading for tomorrow! Some of the illustrations, especially the Route Maps, are rather large files and may take a minute or two to download. Therefore you may prefer to skip them, unless you really need to know the exact route. But I think they are rather interesting. The scales are rather approximate as the maps have gone through several stages of reproduction.